The objective of this study was to summarize the results obtained in a decadelong research project to evaluate novel and conventional technologies (adsorption/bioadsorption, photooxidation, radiolysis, and ozonation) in the treatment of water contaminated with tetracyclines (tetracycline, oxytetracycline, and chlortetracycline). Some of these results have been previously published. It has been found that the adsorption of tetracyclines on activated carbon is governed by dispersive adsorbent-adsorbate interactions and that this process is impeded by the presence of electron deactivating groups in both activated carbons and tetracyclines. The low quantum yield values obtained demonstrate that the application of UV radiation is inefficient to eliminate tetracyclines from water because long exposure times are required to reach 100% of degradation. The application of indirect photolysis, radiolysis and ozonation evidenced that tetracyclines can be effectively degraded from water obtaining the highest degradation rate using ozone and ozone/H2O2. The use of natural water (surface water, groundwater, and wastewater) increased the efficacy of the photodegradation process, with the low concentrations of dissolved organic matter acting as a photosensitizer. However, in general, the effectiveness of advanced oxidation processes was affected by the presence of inorganic anions in the solution, which act as radical scavengers diminishing the amount of radicals in the medium. Finally, the complete mineralization of tetracyclines was not achieved by using these advanced oxidation processes and the byproducts generated in the degradation of oxytetracycline were more toxic in the different types of water. The results obtained in this project have been compared with the most relevant results found in the literature. Keywords: Tetracyclines, water treatment, adsorption/bioadsorption, activated carbon, photodegradation, radiolysis, ozonation. Keywords:Tetracyclines, water treatment, adsorption/bioadsorption, activated carbon, photodegradation, radiolysis, ozonation. Abstract:The objective of this study was to summarize the results obtained in a decadelong research project to evaluate novel and conventional technologies (adsorption/bioadsorption, photooxidation, radiolysis, and ozonation) in the treatment of water contaminated with tetracyclines (tetracycline, oxytetracycline, and chlortetracycline). Some of these results have been previously published. It has been found that the adsorption of tetracyclines on activated carbon is governed by dispersive adsorbent-adsorbate interactions and that this process is impeded by the presence of electron deactivating groups in both activated carbons and tetracyclines. The low quantum yield values obtained demonstrate that the application of UV radiation is inefficient to eliminate tetracyclines from water because long exposure times are required to reach 100% of degradation. The application of indirect photolysis, radiolysis and ozonation evidenced that tetracyclines can be effectively degraded from water obtaining the highest degradation rate using ozone and ozone/H2O2. The use of natural water (surface water, groundwater, and wastewater) increased the efficacy of the photodegradation process, with the low concentrations of dissolved organic matter acting as a photosensitizer. However, in general, the effectiveness of advanced oxidation processes was affected by the presence of inorganic anions in the solution, which act as radical scavengers diminishing the amount of radicals in the medium. 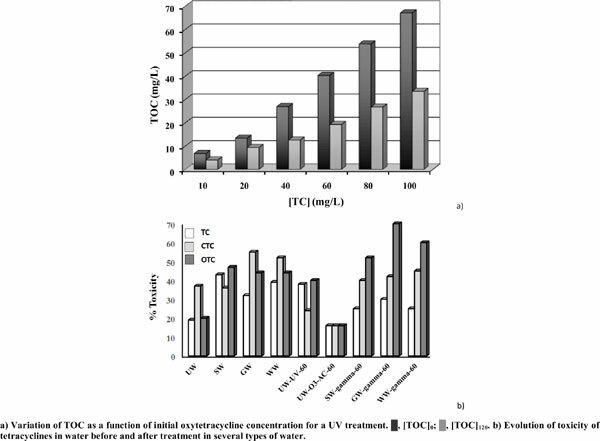 Finally, the complete mineralization of tetracyclines was not achieved by using these advanced oxidation processes and the byproducts generated in the degradation of oxytetracycline were more toxic in the different types of water. The results obtained in this project have been compared with the most relevant results found in the literature.